It does sound cool to not have a driver but an auto-bus, er whatever, but I still wouldn't wanna ride in a driverless bus, because what if the controls or something broke, then it could crash or blow up. Yes I would ride on one of these buses. I love the idea! The only bad part is that some people will become unemployed. This is just amazing and shows how far technology has gone. Wow, it's so cool that they now have buses that have systems that can detect the obstacles ahead without having a driver driving the bus. The article states that a European group that decided to make buses that could have no driver and that could be able to have very little accidents.My question is, what made them come up with this idea, is it because people want to minimize accidents? But then if you have an obstacle-detecting bus, the system might crash and create a whole new problem.My point is there could be accidents both ways with or without a driver. I think the solution is that if u have a combination of the bus driver and the obstacle-detecting bus so if the bus' system crashes, the driver might have a way to fix it. It is cool that there are buses now that people don't need to drive. Also it is less likely for the driver to get into a car accident because it is a machine that is driving the mini bus. Also it is less likely for a machine to get into a car accident because human make more mistakes. But the only way probably the machine will get into a car accident is because other people crash into the mini bus. If it is safe I would ride it. But, won't it be dangerous. Is it controlled by the computer system? If it is, it might be dangerous because sometimes the computer kind of gets crazy, so while it was driving it won't stop. Then what will they do? Will the company pay their family for dying. It is nice to have a free ride with no driver. The bus driver or any taxi will be sad. They won't get to eat because the customers won't like to pay, so they won't ride the bus or the taxi. A driverless bus has the benefits of free rides, "offers an easier way to optimize traffic flow" and erases the possibility of human error on the streets and for these specific CityMobil2 buses, reduce gas usage because of their battery powered models. Also, CityMobil2 buses could possibly also deliver almost the same mobility as today but with 95 percent fewer vehicles. WOW! A driver less bus must be sort of nice. I wish I can ride in one of those. Maybe next time I could ride one next time. If I find one maybe I will ride it. I think that it is cool because there are going to be driverless bus in Europe because I think that the European Union wanted to reduce the amount of carbon emission that is contributing global warming. 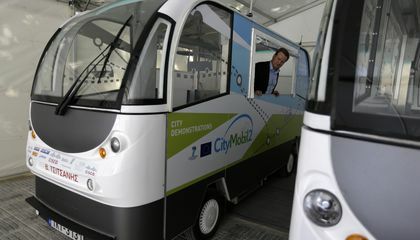 The CityMobile2 bus might have been the bus that the European Union had made with a six-power battery which is powered by electricity which there is a downfall because the bus can only go up to 12 1/2 miles per hour. Some advantages having a driverless bus is that there is no one to pay making the city richer by not having to pay bus drivers. I thought it was interesting that there's no driver and I was curious about how the city would deal with accidents when there's no one to blame.